This is the Caffe Luna brought to you by Caffe Vita Coffee Roasting Co. 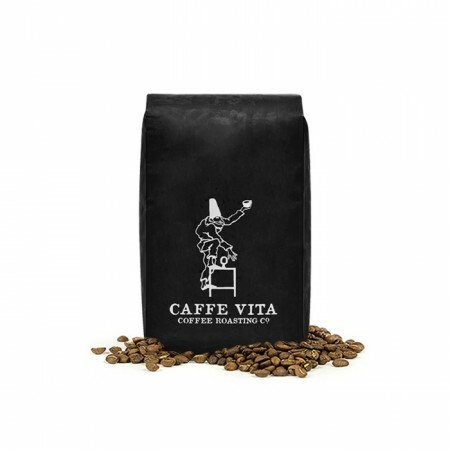 The Caffe Luna is a classic French roast blend with robust aromas of bittersweet chocolate complimented by flavors of vanilla and maple. The cup is full-bodied with a lingering finish. Disappointing for a dark roast. Does not look like a dark roast coffee nor taste like one. It stays on a shelf until I find someone that it appeals to. This coffee was good, but a bit too smoky and a tad bitter for me! I think I may be ready to move to a medium or medium-dark roast to explore those flavor profiles! Acidic in such a way that it overpowers most of the tasting notes. Pretty good dark roast. Very 'drinkable'. Great caramel flavor with a good smoky after taste. Probably my favorite coffee right now. I enjoyed this coffee overall! Some slight chocolatey bitterness and some smoky/roasted flavors as well. A solid dark roast. Overly roasted and one dimensional. Did not like this at all. This has all the makings of a great espresso, but unfortunately wasn’t right for my drip setup. ok. We did like this more than the others. Just lured the ale Corbusier beans in tonight so will get to taste them tomorrow. I have a gripe about your packaging. The box is slightly too big to fit in a standard multi-gang USPS mailbox like they have in townhomes. Gets stuck in the mailbox and is all smashed. Makes me a hater to get it out of the mailbox—lots of squeezing and crushing and tugging and cussing. Research it and see if you can make slightly thinner. Liked it but the double dark was better! Really disliked this one. Even the aroma was bad for me. I think the flavoring was overpowering, maybe the maple or vanilla. The initial sip and aftertaste just didn't taste like coffee to me. This is an excellent coffee. Very dark, oily, and full bodied. The Cafe Vita website describes the coffee flavors as "dark chocolate, baking spice, roasted marshmallow with subtle earthiness, tobacco and maple" and I think it's a perfect description. It has a subtle sweetness to it and very low acidity. Slight bitterness like you would find in a dark chocolate. They use a blend of bourbon and typica varietals and you can tell they are of good quality. Definitely a fan of this one. Best roast I've had so far - smooth finish! I like this one. Very similar to last months. Good french roast. Earthy flavor with long lasting finish. The lingering earthy maple taste was the best part of this coffee. Crema was not great and taste was a little thin on the watery side even with extra fine grind which was needed. Loved this coffee - another great blend! I was puzzled to figure out whether to give this coffee a 3 or a 5. It was great but remarkably average to my taste. I described it to a friend as simply coffee, strong coffee that tastes like coffee. There was nothing that stood out about it and made it original or worthy of note. Didn’t love this. A bit bitter. I wish coffees included grind size recommendations for different grinders and brew methods. I use a baratza virtuoso grinder and, due to laziness, usually the ninja coffee bar. Smelled amazing just opening my mailbox. There was a slightly sweet smell (I'm guessing the hint of caramel and maple). The flavors worked well together and it had a nice bite to it. This one has somewhat of an earthy undertone that we weren’t the biggest fans of. Didn’t seem as rich, either. The smoky element in this one is really working for me. It is just the right balance—I basically feel like all Starbucks coffees taste burnt, but this one doesn’t have that ashtray aspect. Tasty! probably the best one out of the initial batch. Dark and delicious. Was pretty good! Would buy again. This is a delicious blend that yielded an excellent espresso once I had the grind dialed in. This coffee was supposed to ship (from Seattle) on 8/19. As of 8/23, the day it was supposed to be delivered it is still sitting in Brooklyn, NY, where the shipment originated. And I am out of coffee. Might be my favorite so far. Nice cup of coffee. Smokey and bold, just the way I like it. Had to pick this one on my own for fear of getting another light roast sent to me, even though I specifically have dark roast as my preference. Too smoky. The vanilla and maple flavors don't come through enough to help cut the bitterness and smokiness. Awesome flavor and great deep sips. Not my favroite. Don't go for the sweet flavors like vanilla and maple. Rich and dark, without traveling into the bitter territory. I like it, but prefer a little bit more complexity in my coffee - this tastes a little bit too 'one-note' to me with the darkness overpowering any subtleties. Very impressed with this coffee. Rich flavor. It was good but I have had better coffees to be honest. It has good flavor but it's slightly too bitter. It had good aroma, very full bodied, nice bold coffee just too bitter. Very smooth and full bodied. When cold-brewed, the smokiness is dominant, more chocolate when hot-brewed. Not bad. Wish it were stronger flavored. A little dark for my taste. This one is just okay. I don't really know why I don't like it as much. The aftertaste is sour or bitter. I'm interested in trying one of their medium roasts though. This coffee was too dark for us. We would rather move back towards medium roasts. The coffee fell short of expectations when it came to the strength of the coffee itself. The notes are nice and are very much there which was good though. Right now, this is the favorite! Great coffee! Could taste hints of dark chocolate, bold flavor but goes down smooth! After 2 years with Mistobox, this is one of my favorites. Deep notes of chocolate-covered coffee beans without acidity or bitterness. The perfect cup and I ordered more from the roaster. One of the best coffees I’ve had over the years. Dark beans with great aroma (chocolate and fig). Very nice body, smoky, flavor components of vanilla and maple. Awesome coffee for the drop in temps we are experiencing now. I drank this as my typical iced americano but also did a French Press with this one. The vanilla in the coffee was more noticeable when I ate some vanilla granola with the coffee. Very solid roast, definitely enjoyed this. Nice chocolate tone, and rich taste. Overall a good cup of coffee. I am giving this coffee a BAD rating - shipped August 28th - still not arrived. Please let me know what the issue is - this is not the first request for tracking/update information. Would really give this 4.5 stars. Very nice shots. A note of sweetness and rich. A good dark coffee but not great. required a slightly coarser grind than normal. rather unimpressive. A well done French without going overboard. The packaging is great, but made me anticipate a really dark, bold roast. This didn't quite hit the mark. Best for a quick sip in the afternoon.